The 90 audiophile grade integrated amplifier sits above the Primo and Seconda models in the Unico range. Earn 3495 loyalty points when you order this item. 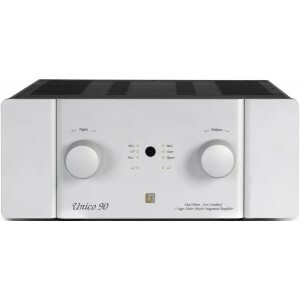 Unison Research's Unico 90 Integrated Amplifier sits at the top end of the Unico range borrowing much of its look and design from the flagship Unico 150 integrated amplifier. The dual mono design gives this amplifier more power and control of your music. Boasting 160W (4Ω) per channel the Unico 90 is capable of driving some of the most demanding loudspeakers with ease and poise. Featuring double triode totem pole ECC 83 and one parallel totem pole ECC81 triode valves per channel in the input stage and using high-quality German Mundorf components, Unico 90 has a unique circuit delivering 160W per channel. This single stage due to the particular circuitry is able to amplify the input signal and directly drive the power stage. This amplifier has two stages, input stage and output stage and uses only local feedback. Unico 90 is a class A hybrid integrated amplifier with zero feedback, as the most precious valve amplifiers use only two stages. All of the gain and subsequently the "character" of the amp, is determined by the only tube stage made with ECC83 and ECC 81in particular multiple-parallel-totem-pole. On the back of the Unico 90, there is broad flexibility with a selection of inputs including two balanced XLRs as well as standard RCA. There is also 4 + 4 speaker terminals allowing for bi-wiring and a subwoofer output to add even more depth and enthralment.